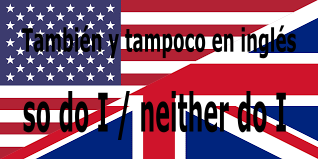 Vamos a aprender cómo se dice también y tampoco en inglés, porque no es tan fácil como en español, pero con un poco de práctica se puede puede dorminar sin poblemas. Digo que no es tan fácil, porque la estructura depende del verbo y/o tiempo verbal que estemos usando. Muchos sabréis que es común usar me too o me neither, pero hoy vamos a aprender una forma que podemos usar en un mayor número de casos. - I like to play soccer. - I don´t like to play soccer. - I am a straight A student. - I am not a straight A student. - I can cook very well. - I can´t cook well. - I played the guitar when I was a teenager. - I didn´t play the guitar when I was a teenager. - I will study at university next year. - I won´t study at university next year. - I would study more if I had time. - I wouldn´t study more if I had time. - I should find a better job. - I shouldn´t find a better job. She wanted to play tennis. I can´t play videogames for many hours. Mike will get a new job very soon. My brother doesn´t like to eat pasta. He doesn´t like expensive cars. I would buy a new house, if I had the money. Your brother shouldn´t join them.